Lubricants are expected to deliver satisfactory performance at all conditions ranging from low to high temperatures, without undergoing drastic changes in their viscosity during the operation. In order to ensure this, lubricant manufacturers rely on viscosity index improvers to deliver optimal viscosity performance at all operating conditions. Viscosity can be described as inherent resistance of a liquid to flow, while viscosity index represents response of the liquid to changes in temperature (generally, from 40°C to 100°C). If a lubricant exhibits drastic change in viscosity over a range of temperature, the lubricant is said to have low viscosity index. Viscosity index improvers are polymers that are added to a lubricant in order to resist change in its viscosity with rise in the temperature. With increase in temperature, polymeric molecules of viscosity index improvers tend to stretch out, thereby increasing the internal friction of the fluid to the flow. With increase in internal friction, the fluid flows at a slower pace, thereby exhibiting increase in its viscosity. Viscosity index improvers can vary greatly, depending on their molecular structure and specific chemistry. Lubricants have become an essential part of the modern-day industry. Almost any type of operation or machining requires some sort of lubricants in order to enhance the overall efficiency of the operation. Lubricants are products that are used to reduce friction between two surfaces, thereby increasing the operational efficiency and providing wear protection to surfaces, which extends machine runtimes and prevents wear and tear of machine parts. A viscosity index improver is an essential part of every lubricant additive batch, as it helps the lubricant to maintain its viscosity when subjected to high operating temperatures. Thus, increase in the demand for lubricants is likely to drive the demand for viscosity index improvers during the forecast period. Rapid ongoing industrialization, especially in developing economies such as BRICS, is also expected to drive the market during the forecast period. Growth of sectors, such as industrial machinery, automotive, and energy, in these countries is boosting the demand for lubricants along with their additives such as viscosity index improvers. Moreover, growth of the automotive sector is also projected to drive the market for viscosity index improvers during the forecast period. The automotive industry is one of the largest consumers of lubricants. This correlates the demand for base oils and lubricant additives with the automotive sector. Thus, increasing demand for automobiles and expanding automotive sector are likely to augment the viscosity index improver market in the near future. Ongoing technological advancements in the automotive industry have resulted in evolution of the engine technology and lubricant oil chemistry over the last few years. This development has improved the engine oil drain interval from an average of 25,000 miles to as high as 50,000 miles for a heavy-duty truck. Moreover, increasing usage of cleaner fuels, high-quality lubricants, dependable engines, and the superior filter technology has raised the average oil drain interval. This rise in the oil drain interval is likely to reduce the consumption of engine oils in automobiles. This, in turn, is likely to restrain the demand for viscosity index improvers during the forecast period. Increasing demand for improved fuel economy, reduction in emissions, and better durability has resulted in the upgrade of automobile hardware. Moreover, the trend necessitates improvement in the lubricant performance, thereby creating demand for viscosity index improvers and performance additives. Significant efforts are being made in this direction in order to improve the performance of viscosity index improvers, allowing blending of lubricants at high viscosity index so as to improve the fuel economy and reduce engine deposits. Therefore, rising need for improvement in the fuel economy is likely to provide lucrative opportunities to the viscosity index improver market during the forecast period. 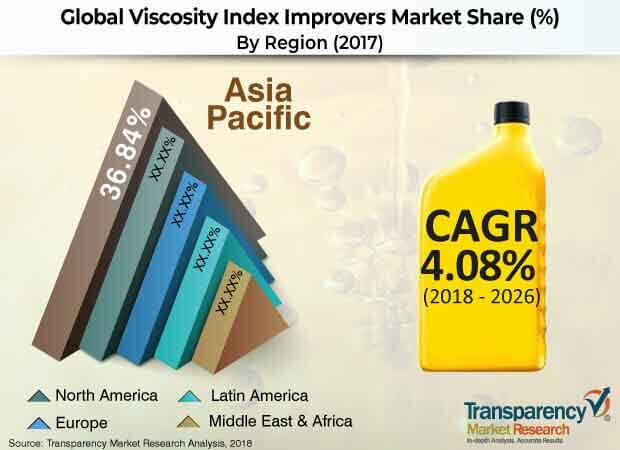 Based on region, the global viscosity index improver market has been divided into North America, Latin America, Europe, Asia Pacific, and Middle East & Africa. Asia Pacific dominated the global market in 2017. This can be primarily ascribed to the region being an automotive and industrial hub. Moreover, the market in Asia Pacific is anticipated to expand at a significant pace during the forecast period, primarily due to rise in the demand for automobiles in the region, especially in developing countries such as China and India. Key players operating in the global viscosity index improver market are Evonik Industries, The Lubrizol Corporation, Chevron Oronite Company LLC, Afton Chemical Corporation, Infineum International Limited, Sanyo Chemical Industries, Ltd., Nanjing Runyou Chemical industry Additive Co., Ltd., and Shenyang Great Wall Lubricating Oil Manufacturing Co., Ltd.
Viscosity index improvers are added to lubricants for improving their viscosity index, enabling them to perform desirably even at high temperatures. Viscosity index improver molecules expand at high temperatures, thereby increasing the internal resistance of the fluid to flow, enabling it to flow at a slower rate and increasing its overall viscosity. Increasing demand for lubricants is expected to be a major driver of the viscosity index improvers market during the forecast period. This report analyzes and forecasts the market for viscosity index improvers at the global and regional levels. The market has been forecast based on volume (kilo tons) and value (US$ Mn) from 2018 to 2026, considering 2017 as the base year. The study includes drivers and restraints of the global viscosity index improvers market. It also covers anticipated impact of these drivers and restraints on the demand for viscosity index improvers during the forecast period. The report also highlights opportunities for the viscosity index improvers market at the global and regional levels. The report includes detailed value chain analysis, which provides a comprehensive view of the global viscosity index improvers market. Porter’s Five Forces model for the viscosity index improvers market has also been included to help understand the competition landscape of the market. The study encompasses market attractiveness analysis, wherein type and end-user industry segments have been benchmarked based on their market size, growth rate, and general attractiveness. The study provides a decisive view of the global viscosity index improvers market by segmenting it in terms of type and end-user industry. In terms of type, the market has been classified into polymethacrylate, olefin copolymer, polyisobutylene, and others. In terms of end-user industry, the market has been divided into automotive, off-road vehicles, industrial machinery, and others. The automotive segment has been sub-segmented into private vehicles and commercial vehicles. These segments have been analyzed based on the present and future trends. Regional segmentation includes the current and forecast demand for viscosity index improvers in North America, Europe, Asia Pacific, Latin America, and Middle East & Africa. The report provides size (in terms of volume and value) of the global viscosity index improvers market for the base year 2017 and the forecast between 2018 and 2026. Market volume has been defined in kilo tons, while the market value has been defined in US$ Mn. Market numbers have been estimated based on type and end-user industry segments of the viscosity index improvers market. Market size of the global, regional, and country-level market has been provided.